Many viruses, especially those which occur frequently in children and are highly contagious, cause skin rashes. Many common viruses are identified by a specific type of rash, but nonspecific rashes can accompany many viruses as well. Viruses that cause rash can be airborne or spread through person-to-person contact. Chicken pox, a highly contagious disease from the varicella zoster virus, infects most children before age 12, the Nemours Foundation states, unless they’re vaccinated against the disease. Chicken pox is normally a benign disease, but can in rare cases have serious complications such as inflammation of the brain, called encephalitis. Chicken pox starts with a fever, sore throat and headache a day or two before the rash appears. The rash starts as small bumps that blister; the blisters break and crust over. New crops continue to break out over 2 to 4 days. Chicken pox, which are extremely itchy, break out on the entire body, including inside the mouth and ears and on genitalia. People who have had chicken pox or the chicken pox vaccine have a 20 percent chance of having shingles later in life. Shingles, caused by the varicella zoster virus becoming reactivated after lying dormant for many years, follows a nerve path and is painful rather than itchy; the rash blisters and crusts similarly to chicken pox. Rubeola, once called “hard” measles or just measles, can be prevented by a vaccine. Measles can be a serious disease and even today kills several thousand people, mostly children every year worldwide. Measles starts with a fever, sore throat, red, light sensitive eyes, cough and runt nose. After several days, tiny white spots inside the mouth, called Koplik’s spots are seen, and the fever spikes up to 104 F or more. The slightly itchy, blotchy red rash begins on the face and spreads downward. The rash lasts around a week before starting to fade. Measles causes complications in up to 20 percent of cases with 1 in 1,000 developing encephalitis. Pneumonia, croup and ear infections may also occur, and pregnant women are at risk for miscarriage or premature labor. Roseola, a highly contagious disease caused by two strains of the herpes virus, occurs most often in children under 2. Roseola starts with a fever, which may rise as high as 104 F. The fever lasts 3 to 5 days, and the child may be irritable and tired. Sore throat and runny nose may also accompany the fever. 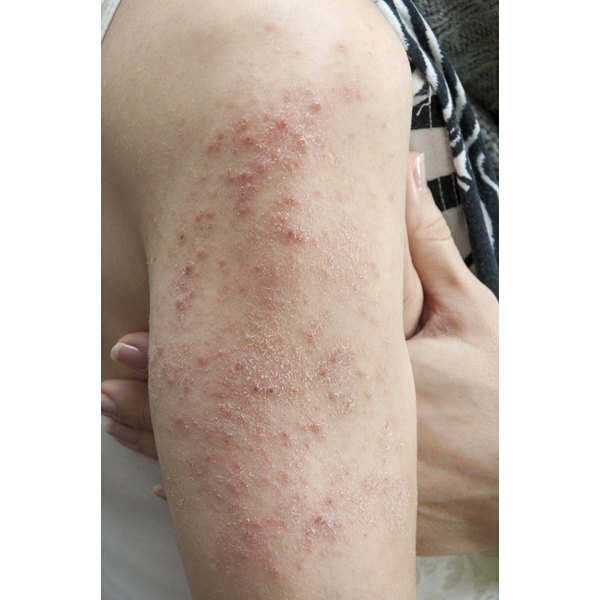 The rash starts when the fever disappears, and usually consists of numerous small flat or raised pink spots which begin on the chest, back and stomach and may or may not spread to the arms and legs.